Growing up, the playground at Jalan Bangkung used to be my turf. Around my area, the neighbours had older children (10-15years older) so my siblings and I had no one to play with. The playground was the best thing there at that time. Then along the row of shops, there was a 7-11 where we discovered slurpee. And Tea for Two, where my dad would order me fish and chips, and I’d sit quietly at a corner while he had his business meeting (I’m easily bribed with food). 7-11 closed down, and Opus Bistro came along, with a string of other restaurants including Leonardo’s, Cava and Tasting Room. I go to Cava and Tasting Room every now and then, because it is nearby my place and I like the ambiance. But this was my first time dining at Opus Bistro. 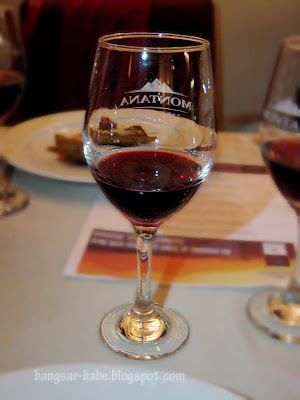 I was invited by Fadlin for an evening of wine and dine with a series of fine Montana Wines. Traffic was horrendous from Damansara Uptown. I reached the place at 7.30pm, hungry. 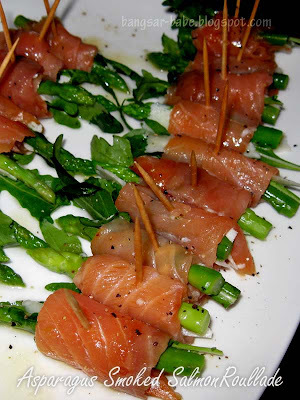 Fine, I was starving and wanted to claim the whole tray of asparagus smoked salmon roulade canapé all for myself. But I felt compelled to be at my best behaviour, so I limited myself to two canapés. And a glass of Montana Classic Sauvignon Blanc 2007. The salmon was quite good, but hardly enough to silence my rumbling tummy. I was prepared to sit with a table filled with complete strangers, but good thing Suan spotted me outside and asked me to join her and KY at their table. By the time the scampi in light tomato broth came, I was at my 4th glass of wine. 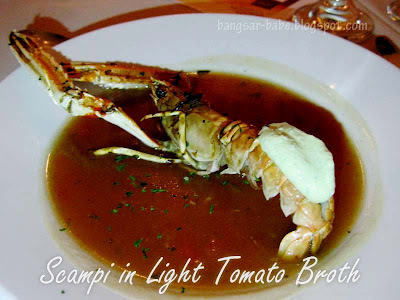 I enjoyed the broth, but there was not enough scampi to taste any natural sweetness. The accompanying wine was the Montana Reserve Sauvignon Blanc 2008. I preferred the first wine — it was zesty, crisp and easier to drink. 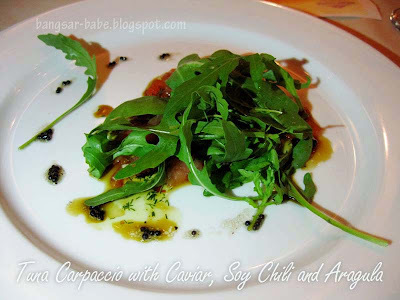 Tuna carpaccio with caviar, soy chilli and arugula had more arugula than tuna. The tuna slivers were refreshing and lightly spicy from the marinade, which went well with the peppery taste of the arugula. I would have loved more tuna on my plate though. This dish was paired with the same wine as the soup. 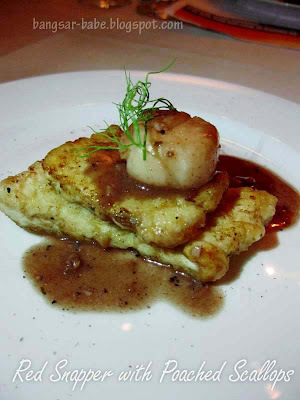 The ravioli porcini in wild mushroom sauce and red snapper with poached scallops came paired with the Montana Reserve Pinot Noir 2006. 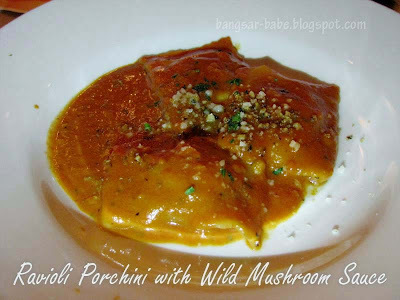 Smothered in creamy and lightly tart sauce, the ravioli tasted quite good but I wasn’t a fan of the red snapper. 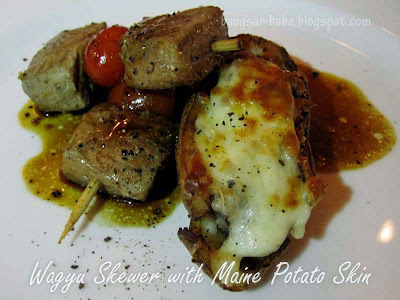 Marinated wagyu skewer (marbling no.7) was moist and delightfully tender. While some girls pushed aside the Maine potato skin, I happily ate mine. This was paired with the Montana Terraces Pinot Noir 2007. Between the Pinot Noir 2007 and 2006, I thought the Pinot Noir 2006 was more intense with a deeper fruity flavour. 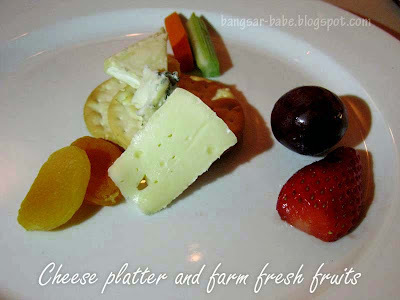 The cheese platter comprised goat, brie, gorgonzola and aged cheddar with crackers, dried apricots and fresh fruits. I enjoyed the gorgonzola, which was pungent and crumbly. Very nice with the Montana Brancott Sauvignon Blanc 2008. I enjoyed dinner, especially the company and wines. For RM150nett with good wine, I’d say it’s a pretty good deal. It was nice meeting KY of KYspeaks.com. Thanks for inviting me to sit with you, Suan! Is this on going or only for 3rd of March? with so much free flow wines, its of course fun!! whee!! 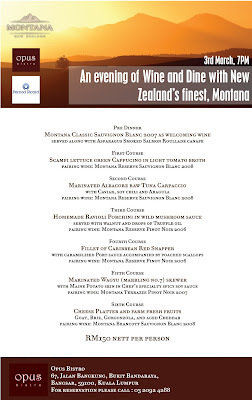 The event is a one off thing, where ussualy we will have the winemaker of said wines down to host the dinner. In this case, the brand manager (name hard to pronounce) of Montana, New Zealand was down courtesy of Pernod Ricard Malaysia. The wines are not actaully free flow, it is meant for one glass per dish but most of the time we will pour the respective wines until finish (usually we will place 4-5 bottles per wine). 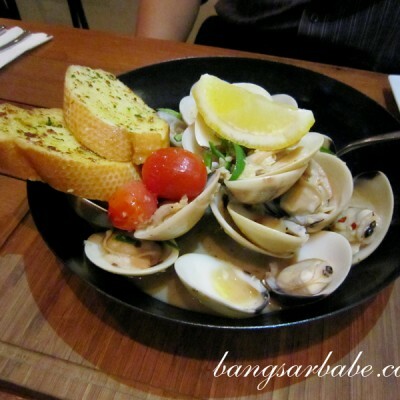 leo – RM150 and a glass of wine per dish. M Ỡ Қ ҝ ¥ – I'm using the Canon A1000IS. Fadlin – Thanks for the clarification! Joe – Oops…my bad. I thought it was free flow, because the waiter kept topping my glass with wine. It's actually one glass of wine per dish. So 6 glasses in total. Sean – Yeah…I like going to the restaurants there because it's easy to park! .. " had more arugula than tuna "
hehehe looks like this is a good place – really close to both of us to go makans!!! vialentino – Yup…it's a really nice place to go on dates or quiet dinners. Christine – It's surprisingly not that expensive. I think I can have a proper dinner with wine for less than RM300 for two.